“In a time of complex development challenges, the investments we make today in women’s, children’s and adolescents’ health and wellbeing will help build the peaceful, sustainable and inclusive societies we have promised to achieve through the Sustainable Development Goals,” Mr. Guterres affirmed. “All that we strive for as a human family—dignity and hope, progress and prosperity—depends on peace,” said the UN Secretary-General. “Peace cannot exist without development and development cannot exist without health and wellbeing, for healthy and empowered women, children and adolescents can bring about the change needed to create a better future for all,” he added. The UN Secretary-General joins Co-Chairs President Michele Bachelet, of Chile, and Prime Minister Hailemariam Desalegn, of Ethiopia, alternate Co-Chairs former Presidents Ms. Tarja Halonen, of Finland, and Mr. Jakaya Kikwete, of Tanzania, as well as other 16 members of the Group. “Every Woman Every Child welcomes the UN Secretary-General as Co-Chair of the High-level Steering Group, as we work together to ensure that global advocacy is translated into local action and impact for results,” President Bachelet noted, highlighting that the movement is ready for its next phase under the leadership of the UN Secretary-General, Mr. António Guterres. As a global multi-stakeholder partnership, Every Woman Every Child provides a unique platform to unite stakeholders across sectors to deliver on an integrated agenda for women’s, children’s and adolescents’ health and wellbeing. 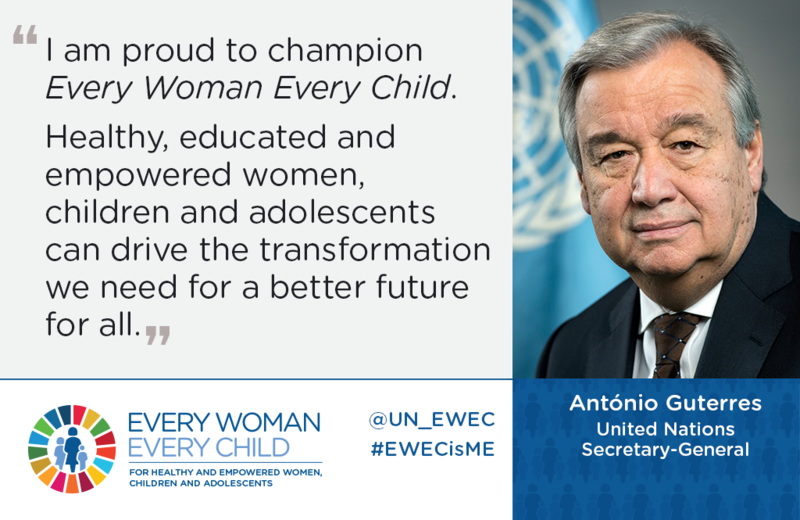 The movement puts in action the EWEC Global Strategy for Women’s, Children’s and Adolescents’ Health, which provides a blueprint to help countries implement the SDGs. Such efforts are supported by the Every Woman Every Child core partners, which include: the H6 (UNAIDS, UNFPA, UNICEF, UN Women, WHO and the World Bank Group), the Partnership for Maternal, Newborn and Child Health (The Partnership), the Global Financing Facility (GFF) in support of Every Woman Every Child, and the Every Woman Every Child Innovation Marketplace. Over the past seven years, the movement galvanized ambitious action and coordinated efforts across sectors. Since 2015, over 60 country and 150 multi-stakeholder commitments have been made by Every Woman Every Child partners, totaling over US$27 billion to deliver on the promises of a sustainable future for all by 2030. All women, children & adolescents, everywhere, should be able to fully exercise their rights & be treated with dignity & respect. Every Woman Every Child is committed to making this a reality, where human rights underpin all efforts for health & wellbeing. Too many are still left behind despite progress over the past decade. Our efforts across sectors must amplify common goals—especially for education. Through the Every Woman Every Child movement, we’re working to change this. Canada is committed to working with this group to ensure that every woman, child and adolescent is empowered to become what they chose to be. Building partnerships and working at the local level will be key if we are to achieve real results and build a better future for them. Investing in women, children & adolescents means investing in more sustainable, prosperous equitable & resilient societies. This is the future we want & what we are working for. We must work together in partnership to move the needle—standing as one for those who need us most. I am committed to Every Woman Every Child. We must do more to ensure all women, children & adolescents can access quality care, no matter where they are. Together with Every Woman Every Child, I’m committed to do my part to make this a reality for all. The investments we make in women, children & adolescents will build a stronger, more resilient world for everyone. That means leaving no one behind. Together, we must reach women, children and adolescents everywhere but especially those who are hardest to reach; they form the last mile in vulnerability but the first mile in our response. Partnerships across sectors are critical to achieving sustainable peace & development. We all have a role to play to unlock the full potential of women, children & adolescents. Through Every Woman Every Child, we can and will make a difference. Equality, empowerment & participation for women, adolescents and children. It is their right, and our responsibility. I am committed to make this a reality, and to transform and sustain our communities. I support the Every Woman Every Child movement. As key drivers of transformative change, adolescents must be front & center in all that we do. I’m proud to support Every Woman Every Child and ensure young people are heard and counted. The private sector has an important role to play in improving women’s, children’s and adolescents’ health and wellbeing. We are ready to meet the challenge and boost action in support of Every Woman Every Child. If partners work in silos, we’ll never secure the health and well-being of all women, children and adolescents. Every Woman Every Child is bringing leaders together to achieve meaningful, lasting change for the world’s most vulnerable. ensure a better future for all. All children have a right to the best start in life. Investment in the health of women and children is also one of the best ways of building a more prosperous world.